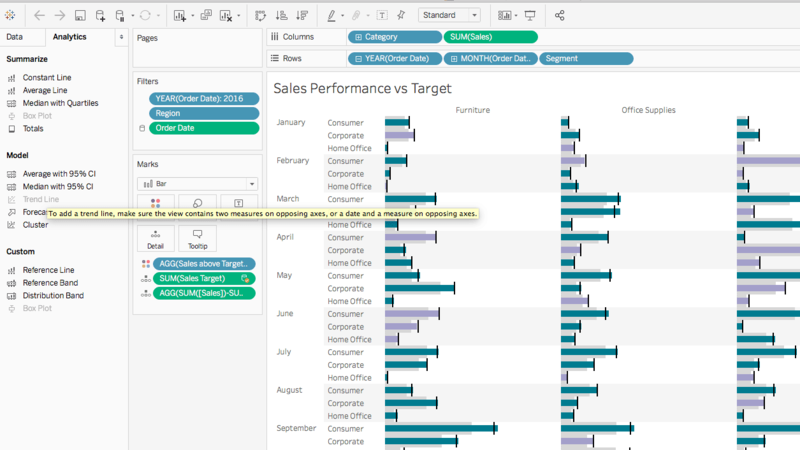 Update: Tableau 2018.1 is here! Download it now to try out the features outlined below. Enjoy more powerful visual analytics with step and jump lines to accurately display your discrete data. Connect directly to geospatial data stored in SQL Server to quickly visualize geospatial data in Tableau. Plus, new guidance for analytic objects makes it easier to understand whether specific analytics are possible based on your current view. 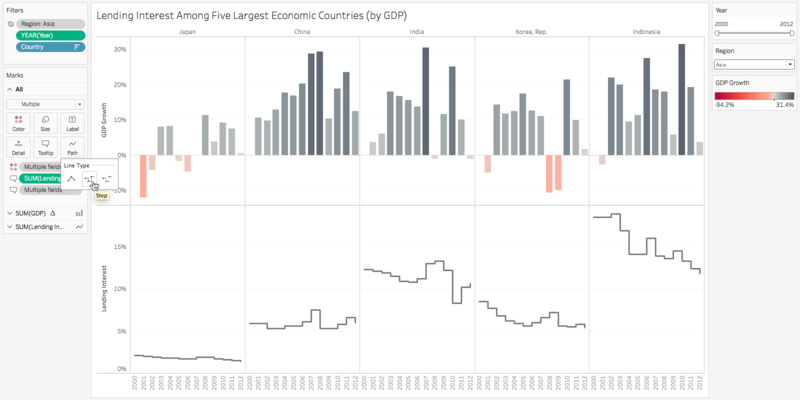 Let’s take a closer look at some of the most impactful features coming in Tableau 2018.1. The ability to visualize your non-continuous data is here! Step and jump lines are primed for your account balances, inventory levels, or interest rate data to give a more accurate representation of how the data actually changes. Turn any regular line into a step or jump line by clicking on Path in the marks card and choose from the three options: continuous, step, or jump lines. All it takes is one click. Use step lines to emphasize the magnitude of a change and jump lines for showing the duration of a change between points. 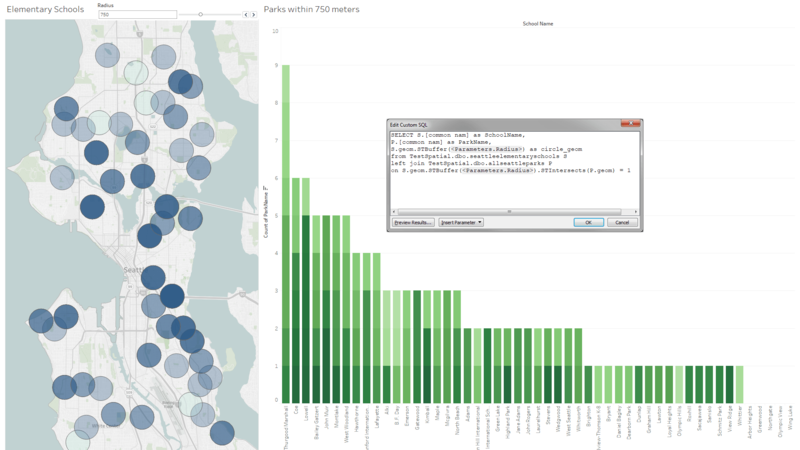 In Tableau 10.2, we delivered spatial file support enabling you to incorporate custom geospatial data. Now, we’re making it possible to connect to spatial data directly in SQL Server. Keep your live connection and use custom SQL to execute spatial operations in the database for more advanced geospatial analysis. Better understand the state of disabled objects in your the analytics pane. Analytic objects don’t work in every view—and now you’ll have a better understanding of why. When an object is disabled, you’ll see what’s needed to use that capability. We are working hard to get Tableau 2018.1 out the door, but first we need your input! We want your feedback as early as possible to catch any issues and ensure great new features. The features included in beta and in the final version of Tableau 2018.1 may change over time as we complete beta testing. Participate in alpha and beta programs for early access to new features, versions, and products. Engage directly with the Tableau Dev team through user research, product discussions, and feedback activities around topics you care about. Explore the Ideas forum to see which ones have been incorporated based on your feedback, and be sure to continue adding feature requests to inspire our development team. We couldn’t do it without you. Visit the Coming Soon page to see all features in beta today as well as what’s planned for upcoming releases. We’ll update the site throughout the beta period with more information and deep dive videos. Not all functionality described above is available in the beta program today. Some features will be added in the coming weeks. The beta program is available for existing Tableau customers. Customers with an active maintenance license can upgrade for free when Tableau 2018.1 is released. Actually I think the best feature of this beta release is one not mentioned here - dual axis mapping improvement where you can combine and overlay BOTH generated lat/lon and data specific lat/lon coordinates on map. That is huge.